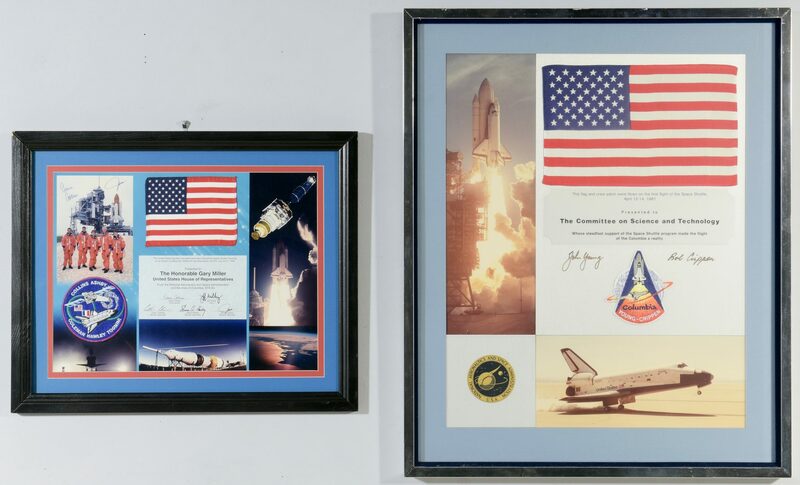 2 Framed Space Shuttle Columbia Crew Patches and Flags, with astronaut autographs. 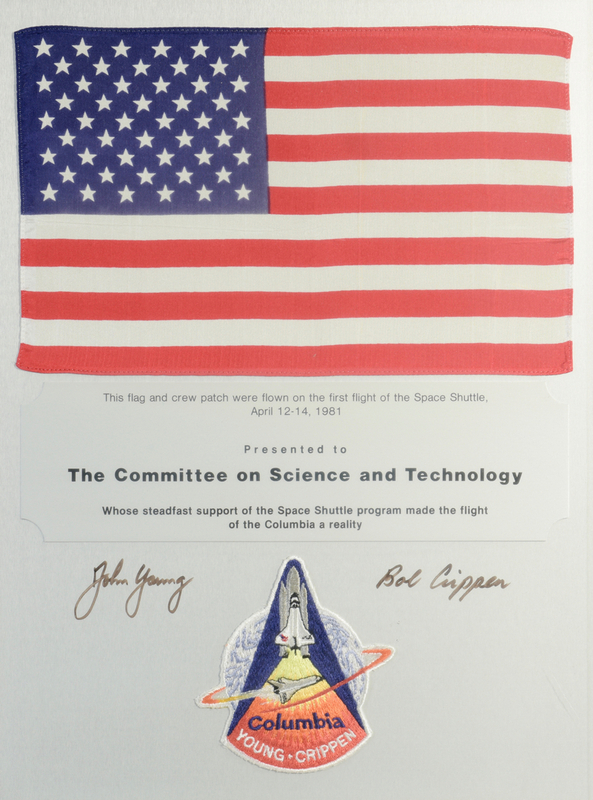 1st item: Space Shuttle Columbia Crew Patch with embroidered insignia, and 12" x 7" Flag, flown on the first flight of the Space Shuttle, April 12-14, 1981, adhered to board with printed presentation inscription "to the Committee on Science and Technology, whose steadfast support of the Space Shuttle Program made the flight of the Columbia a reality." Autographed by John Young and Bob Crippen, with photographs of the shuttle taking off and landing and a NASA badge. 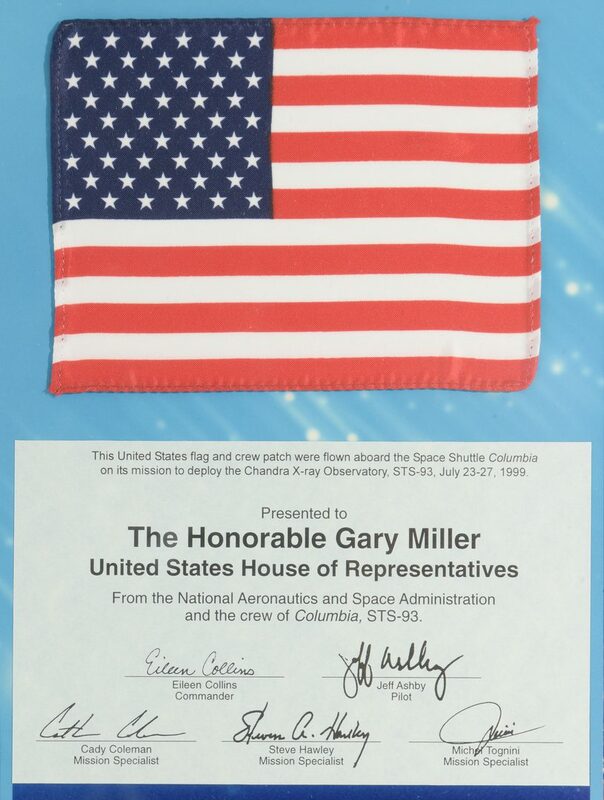 Overall – 29" H x 24" W. 2nd item: Space Shuttle Columbia Crew Patch and 4 1/2" x 5 1/2" Flag, flown on the shuttle's mission to deploy the Chandra X-Ray Observatory, STS-93, July 23-27, 1999. 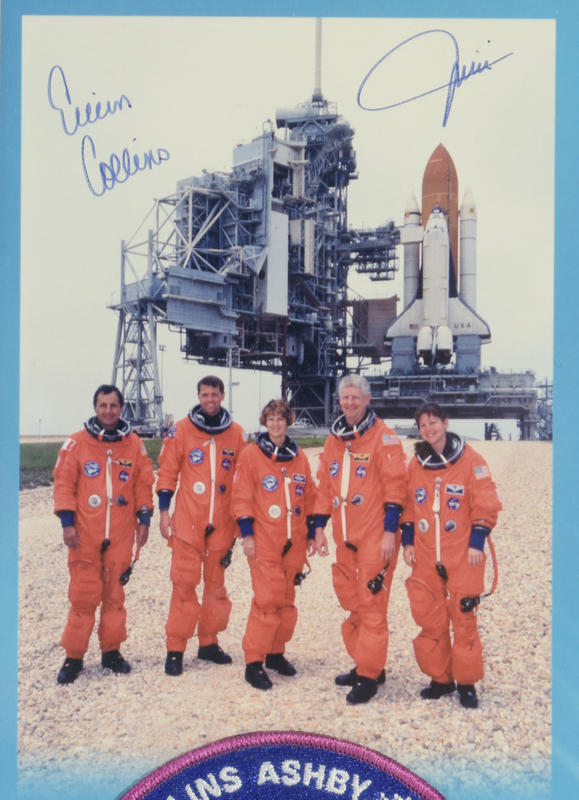 Photograph of the Shuttle Crew, with autographs of Commander Eileen Collins and specialist Michael Tognini, along with printed versions of autographs by five crew members and three related photographs. 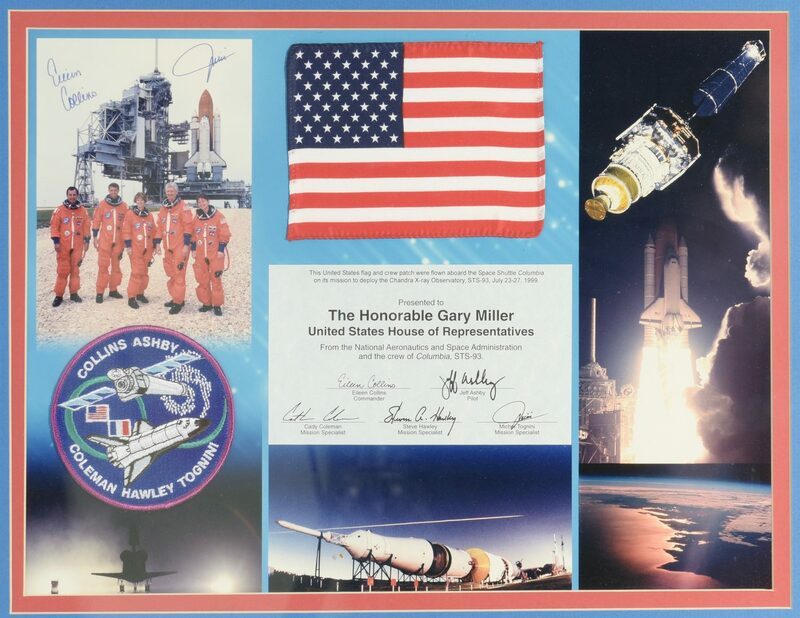 Overall – 17 1/2" H x 21 1/2" W. History: "A new era in space flight began on April 12, 1981, when Space Shuttle Columbia, or STS-1, soared into orbit from NASA's Kennedy Space Center in Florida. 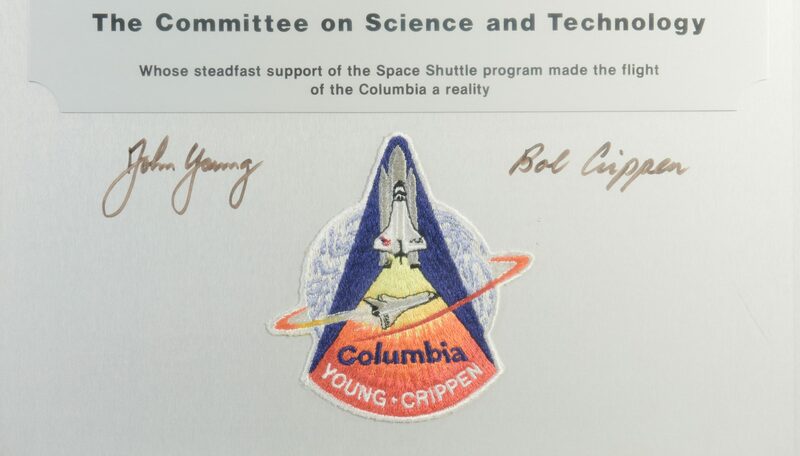 Astronaut John Young, a veteran of four previous spaceflights including a walk on the moon in 1972, commanded the mission. 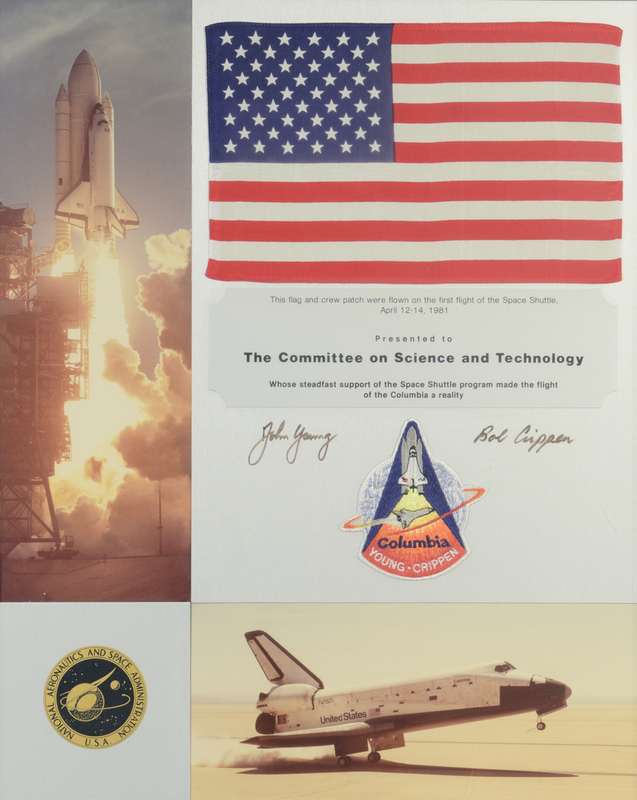 Navy test pilot Bob Crippen piloted the mission and would go on to command three future shuttle missions. 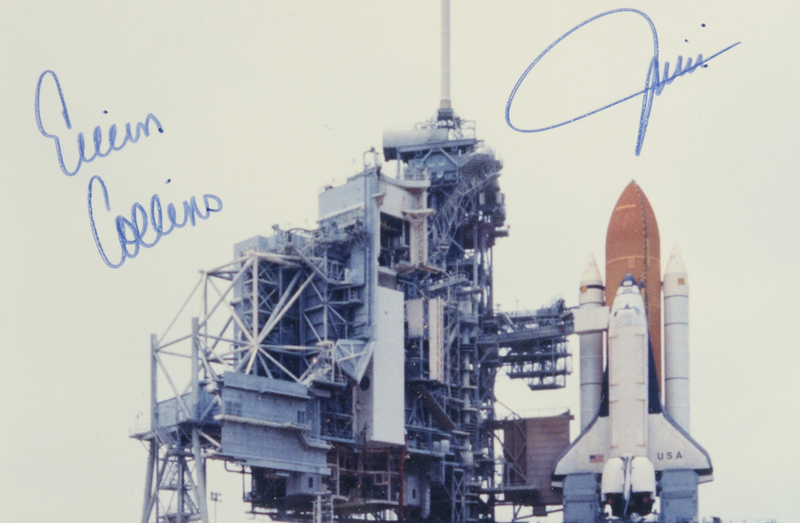 The shuttle was humankind's first reusable spacecraft. Named after the first American ocean vessel to circle the globe and the command module for the Apollo 11 Moon landing, Columbia continued this heritage of intrepid exploration. 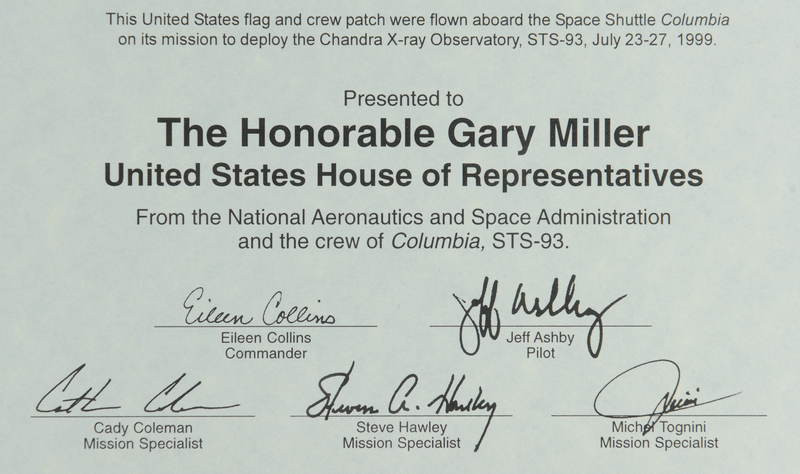 Perhaps Columbia's crowning achievement was the deployment of the gleaming Chandra X-ray Observatory in July 1999. Carried into space inside the orbiter's payload bay, the slender and elegant Chandra telescope was released on July 23. Still in flight today, the X-ray telescope specializes in viewing deep space objects and finding the answers to astronomy's most fundamental questions. Columbia and its crew were tragically lost during STS-107. As the Space Shuttle lifted off from Kennedy Space Center in Florida on January 16, 2003, a small portion of foam broke away from the orange external fuel tank and struck the orbiter's left wing. The resulting damage created a hole in the wing's leading edge, which caused the vehicle to break apart during reentry to Earth's atmosphere on February 1, 2003." – source: excerpted from NASA.gov. Provenance: collection of a US Naval Officer, given to him as a gift. CONDITION: Light toning/fading to photographs, overall very good condition.